Dynamo Power: The hand crank generator charges the internal NI-MH Batteries. 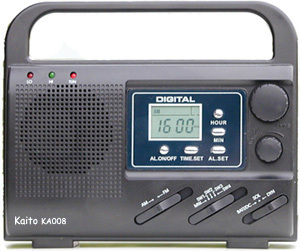 Solar Power: You can play this Radio with the direct Sun or charge the NI-MH batteries. With 12 hours in the Sun, you get 6-8 hours playing. Batteries: 3 AA batteries allow you to play the Radio the old fashioned way. Electric: With the included AC adapter, you can play or charge with 110V electricity. 6 hours charging = 48 hours playing. The KA008 is only 6 1/2�X5 1/2�X 2 1/4� so it is small enough to take everywhere. AC/DC adapter, Earphone and Soft Antenna included.